FILL OUT A SEPARATE FORM FOR EACH HORSE YOU PLAN TO ENTER. PLEASE ONLY ENTER IF YOU PLAN TO ATTEND. YOU ARE RESPONSIBLE FOR PAYING FOR WHAT YOU ENTER/RESERVE. Pre-registration is not required, but MUCH appreciated to make the entry process fast and efficient for you. Pre-Registration will close the FRIDAY prior to the event at 5:00 pm. Entries after that time can be handled at the show office. You will be placed in the draw after your fees are paid. Sessions/Exhibitions MUST be paid for prior to riding. **Youth draws with the open class. If you enter both youth and open, your 1 run rolls over into the youth. 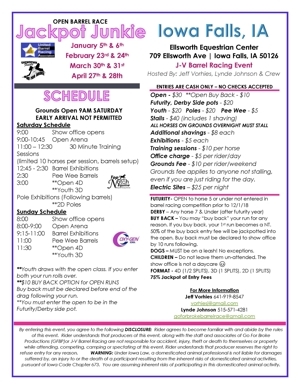 GROUNDS FEE $10 PER RIDER/WEEKEND IF YOU ARE "JUMPING OUT"
Pre-entry is NOT required but is appreciate to help us bring you a fun and smooth weekend.